Vex is a popular action adventure style game and it is played by the children and adults as well. The game is found in 4 different versions and every version has something which is new also exciting to its players. The game has the graphics that are simple but their difficult level may depend to the level and they are more challenging for higher players. The game is great for the people who want to do it in few hours or few minutes. You may try the version one first to see how many hours it may take you to be able to complete it. The original game is now based on a simple idea of having more the character which is a stick figure from the starting point up to the ending point at every level. This may sound easy but it is not since the person faces the imminent danger at every corner. 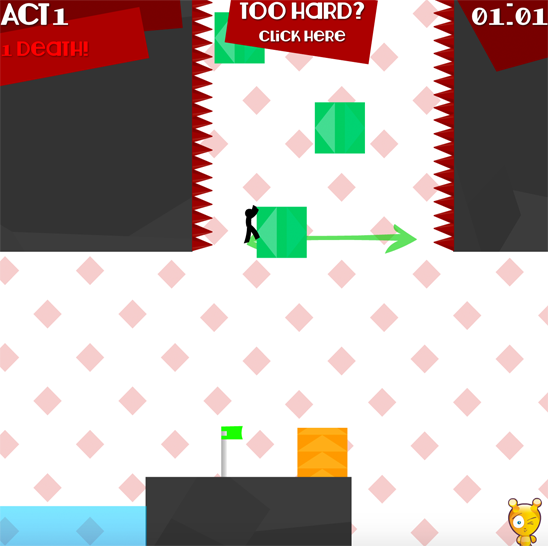 The little stick man has to dodge the spikes and more obstacles so that he may reach to the final destination and do it in the record breaking time. Vex is the action packed adventure and it has many challenging levels with the customizable key controls with the impressive graphics. If you want to spend some hours on something which is challenging, then this is the game for you. When it is the first time that you want to play vex, you may be overwhelmed since the game may seem difficult. You should be careful when it comes to jumping since the character is not able to fall too far without becoming a fatal landing. You can slide on the walls at the extreme heights and this is not always the right idea. The character may have the hands tired and he may let go of the wall and this will mean the clash on the ground. You need to plan the landings and the jumps in a wise way. You should try to stay away of the spikes since they are not friends. When you swim, you should use the directional keys in swimming towards the direction you want to take and the right direction is the one where the head is pointing to. The game has two options to use while playing. You may choose to play a game which has been pre-developed by the developer or you may create own stage. In the option panel, you should customize your game so that it can suit the play style with the comfort level. You may choose between high-quality, medium or low graphics and you can adjust the particles to the level you want. You may toggle the sound and music effects on and off so that you can clear the games that have been saved within the system. The stage builder mode let you build or create the stage you want and how you want it. The mode has own set of the control hot keys and if you have finished to design own stage, you may choose to play or you can email the game to the developers so that they may suggest it to Vex Community.